Antibiotics are important medicines that fight infections caused by bacteria. They do not work against infections caused by viruses such as colds, the flu, and most sore throats. Antibiotics can be in the form of pills or liquids. Examples include penicillin, erythromycin, and ciprofloxacin. Before scientists discovered antibiotics, there was no effective treatment for bacterial infections such as strep throat, pneumonia, and meningitis and many people died from these causes. 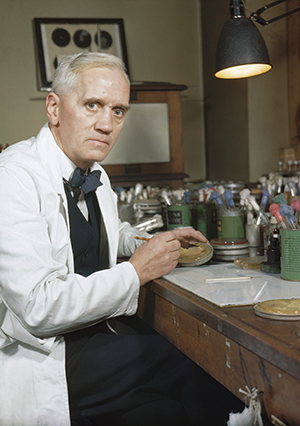 The first antibiotic was discovered by accident in 1928 when a British scientist named Alexander Fleming noticed the bacteria in his lab wouldn’t grow near mold. The antibiotic, penicillin, was derived from this mold. Fleming’s discovery of penicillin led the way for the development of many other antibiotics, which have since saved millions of lives. Antibiotics work by either killing the bacteria, or stopping the bacteria from multiplying. They can work quickly and cure bacterial infections such as strep throat, urinary tract infections and pneumonia. Different antibiotics are required depending on the type of infection and the bacteria involved. However, because antibiotics have been used too much, and not always in the right way, some antibiotics do not work anymore. This is called antibiotic resistance. You will learn more about antibiotic resistance in the next lesson. Watch the videos from the Provincial Health Services Authority to learn more about antibiotics. After watching the videos, test your knowledge with the quiz and earn vaccines! These lessons were developed in partnership with the BC Centre for Disease Control’s Community Antimicrobial Stewardship Team.